I was thinking of having a Sazerac tonight, but sadly am lacking a bottle of rye currently. While a little saddened by this fact, it did make me think of Dale de Groff’s wonderful personal take on the Sazerac from his book The Essential Cocktail (a fantastic book that you should probably have in your library, or nestled between bottles on your bar). In his twist on this classic cocktail, he mixes equal parts rye and cognac, which is actually a half step between the original recipe that called for cognac only, and the modern rye based drink. 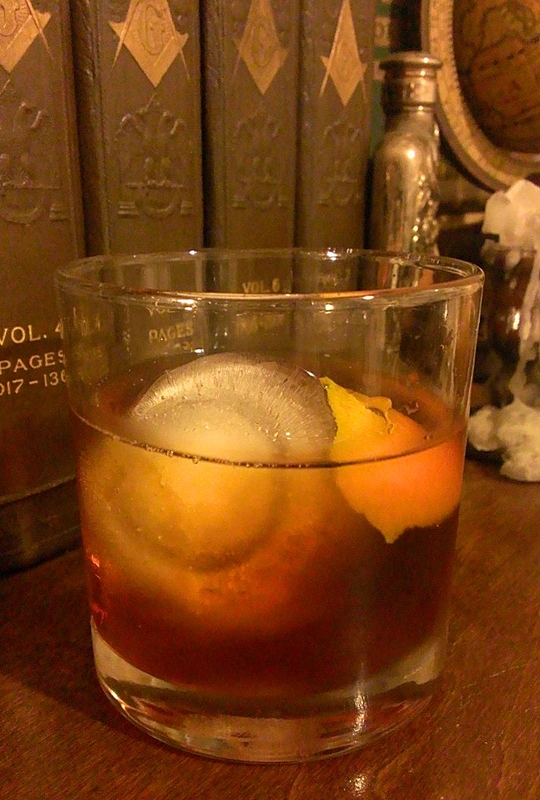 That got me to thinking about fixing an original brandy-based Sazerac, as I had a bottle of cognac at hand. Certainly, it’ll be a sweeter drink than the rye based version, and while I’m not opposed to that, I started thinking about how I could balance that sweetness out, as well as how it work if I decided to forgo the absinthe. My first thought on the latter was not very well, honestly. So, what to do? Well, if we take the absinthe out of the equation, do we still have something solid to go with? So we’re now looking at brandy, a combination of bitters and sugar, with some citrus as a garnish. Okay, that’s certainly workable, but we still have a drink that’s going to trend towards the sweet, without a balancing flavor, and I wasn’t in the mood for something too sweet. And then I saw the bottle of Cynar, sitting behind the brandy. Cynar is an Italian bitter liqueur made from various herbs and plants, chief amongst them being the artichoke. I know what you’re thinking; an artichoke liqueur, that sounds ghastly. Believe me, I was of the same opinion when I first heard of it. But Cynar is a wonderfully bitter, and boy do I mean bitter, apéritif, and is an excellent way of imparting bitterness to a drink without adding a lot of complicated flavors that will overpower things. That said, it would certainly do well to counteract the sweetness of cognac, and serve to give a focal point to this cocktail: bitterness. With the extra bitterness from the Cynar, replacing the lemon twist called for in the Sazerac with a bit of orange peel seemed a decent thought, as I know from one of my favorite cocktails coined by a good friend makes good use of pairing orange and Cynar. So, in the end I wound up with the following in my glass, and I have to say I’m well pleased with the delightfully bitter drink. To start off, I combined the bitters and sugar in an old-fashioned glass and started to mix them into a thin paste. I then added the Cynar and continued to stir until I had a nice homogenous solution of bitters, liqueur and sugar. I then added the cognac and a single large piece of orange peel and stirred for a few seconds more before adding a single large piece of ice. For those that haven’t played with Peychaud’s bitters, this wonderful gentian based bitters created by the estimable New Orleans by way of Haiti apothecary, Antoine Amédée Peychaud carries with it hints of cherry and anise, and is sweeter than many typical bitters. Combining this with the rich, spicy, cinnamon tinged Old Fashioned bitters from the good people of Fee Brothers, brings some nice, complex flavors to this drink. The predominant note is bitter, a result of the aforementioned bitters, but primarily from the Cynar. The sugar and cognac give a sweet finish in the mouth that outlasts the bitterness that hits the front of your tongue. The orange gives a brightness to the drink, and plays very well with the warm spicy notes from the Fee Brothers Old Fashioned bitters. A note on the ice: I have four different types of ice trays / molds that I use, from tiny cubes all the way up to large spheres that nearly fill an old-fashioned glass. For this drink I chose to use the largest option, the massive sphere, for a couple of reasons. First and foremost, the larger piece of ice and its increased surface area means it’s slower to melt, which is critical for this drink. This is a sipping cocktail, and if I used smaller pieces of ice, before I was halfway through it, my drink would be tragically watered down. Secondly, using a larger hunk of ice also means a more moderately cooled drink. Again, smaller ice would have chilled the drink more over time, and the bitterness and subtle flavors of the bitters would have been lost in the cold. This drink, or at least its bones, has been knocking around in my head since before I launched Experiments From The Bar. I’ve jotted down or typed out a couple of variations, but never put any of them together, because they just didn’t feel right. This evening, in an attempt to be a good husband, I gave the living room a good dusting. I was in the midst of wiping all the bottles from the bar down with a wet rag when I picked up the bottle of crème de cassis and thought tonight’s as good as any to try out the Briarpatch. 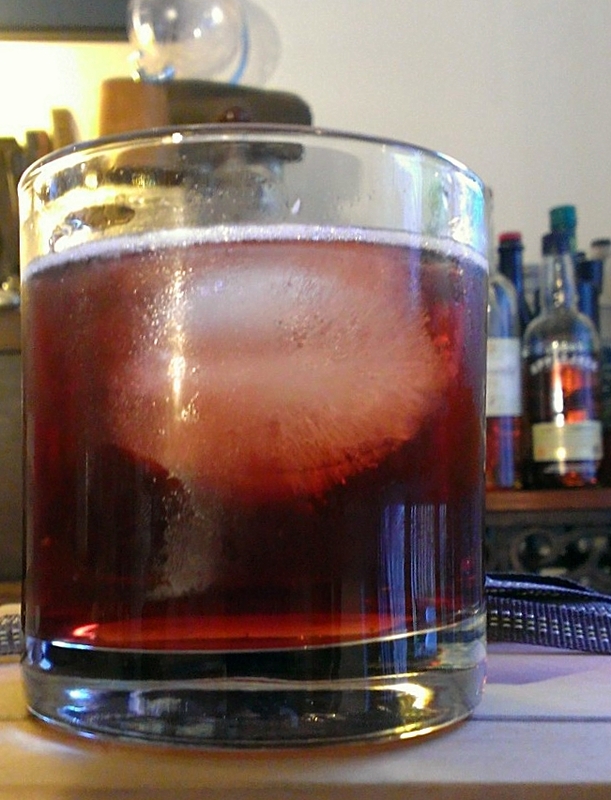 The core ingredients have remained the same in all the iterations of the potential recipe: bourbon and crème de cassis. The other ancillary ingredients, which in the end define the drink, have shifted around. Bitters, certainly a must, but which? Something herbal, as well, that seems right. That last bit ran the range from an absinthe wash, to a dash of crème de menthe, to Amaro. What about a mixer? Soda water? No, that’ll just dilute things down without adding anything. With no mixer, the crème de cassis might come on too strong. All ingredients were combined over a single, large piece of ice and lightly stirred. This prevents the drink from getting to chilly, which would alter the flavor, particularly of the crème de cassis, losing some of the faint sourness that cordial carries.